I've been following dozens of web analytics blogs over the past couple of years and one of my goals has always been to make it easy to share and leverage this information with other web analytics practitionners. 2007: I created a master Feedburner feed I called "Web Analytics Conversations" and manually maintained a list I published on my blog. Maintaining the list was long and tedious. 2008: In the fall of 2008, I developed a mashup of Feedburner and Google Blogs Search which provided latest posts and automated ranking of blogs. However, Feedburner is having so much trouble and the API is so unreliable that my solution didn't really work well. 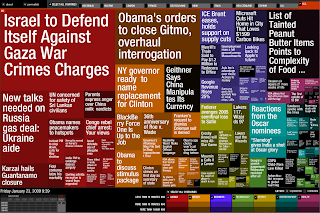 2008: In late 2008, AllTop create a topic dedicated to web analytics. However, I don't find the interface that intuitive either. 2009: I have created a Wikio page dedicated to web analytics. This looks very promising: all feeds are readily available if you want to subscribe to specific ones and you can vote for the best articles. The approach is very interesting, so I'll give it a try! However, there are a couple of things I'm not sure about: If you add this page to your own Wikio account and I add/remove feeds later on, will you get those changes too? Now, it would be amazingly cool to have this feature for the Web Analytics Conversations!